2004 edit: I realize this review really became more of a breakdown rather than a to the point review but at the time, enthusiasm was high and although it hurts to see these old reviews sometimes, I think there is lies something valid in seeing the reviewing style develop through the years. From the start, crap. Today, less crap. If you once upon a time read the intro on the main page, you'll know my first experience with Hong Kong cinema came via the heroic bloodshed genre and not the old school kung fu. I'm not a child of the 70s either so I wasn't surrounded by all those wonderful (and some not so wonderful) martial arts movies. All that I've basically watched out of the 70s smorgasbord is of course the Bruce Lee movies and Sammo Hung's first movies as director. Then why haven't I bought and watched all the classics I've missed? Well, the fact remains that not a whole lot of them are available in widescreen or original language which is my preferred choice in viewing any movie. English dubbing can of course bring more enjoyment to a kung fu movie experience than a subtitled version would but I still have a problem getting into the movies in the form that they're mostly available in now. Therefore I would rather wait for releases that presents the movies in their original form and that is where Pathfinder's release of Jimmy Wang Yu's Master Of The Flying Guillotine comes in. Not only have they taken the original negative and restored at the best of their abilities but they've also reinstated about 12 minutes of footage not seen since it's original theatrical release in Hong Kong. Now I was ready to experience Master Of The Flying Guillotine! This was not the first time Jimmy Wang Yu had played this character. His breakthrough as an actor and the first movie where he played a one armed character was in Chang Cheh's classic One-Armed Swordsman and he later reprised the role in movies such as Return Of The One Armed Swordsman and the Hong Kong/Japanese co-production Zatoichi Meets The One Armed Swordsman. The concept of the weapon called the flying guillotine had also been explored in the Shaw Brother's produced movie Flying Guillotine but Master Of The Flying Guillotine is probably the movie that fans and people in general remember the most. The fact that it played at drive in's across America in 1977 probably didn't hurt either and it had quite a following on video (but in cut and dubbed form). After my first viewing I could understand it's popularity and the term 'Only in Hong Kong' comes to mind. As a director Jimmy keeps a calm pace at first and the opening sequence with Fung preparing for his journey and practicing his skills is nicely edited and atmospheric. As a reviewer you normally start questioning why a blind man has such good senses that he can aim the guillotine with 100% precision each time but then again but this is a movie where you should just turn off your brain (thankfully, otherwise this review would've been even longer) and be entertained . The hilarious sound effects of Fung's demonstration takes us into the opening credits which strangely has another on-screen title following the Master Of The Flying Guillotine one, something which I guessed had to do with the different sources needed to put together this uncut print. The audio commentary on the disc confirmed my suspicions of that. Speaking of the commentary, it helped me, as a novice to these movies, to highlight some of the things Jimmy tried to do differently compared to other movies made at the same time. Also some of the trademark elements of the genre such as the obligatory tournament sequence was pointed out to me. Very helpful. The direction outside of the fight scenes feels like it's up to a good standard for the era and first and foremost up to a good standard for an independent production. Jimmy uses the 2.35:1 frame to good effect and also adds some establishing overhead shots at times to give us a sense of geography and scope. It's not revolutionary filmmaking but it grows slightly as a production thanks to the choices made. The first taste of the fight choreography we get in the audition scene for the big fight tournament and Lau Kar-Leung and Lau Kar-Wing's work may not excite people who've only seen the fights in The Matrix but for a 1975 production the fights seemed ok to me. This was of course before the use of wires took over the industry as we know it today but still, at the time the ground based stuff and high flying feats through the Wuxia tales were sights the audiences were used to (albeit more crudely in regards to the latter genre of films). The fights are indeed executed in a good manner and the camera work and editing are good giving a taste of the potential already in Lau Kar-Leung. He had of course worked as a choreographer on Chang Cheh's many highly regarded movies and also later as a director himself of such classics as 36th Chambers Of Shaolin. A bit into the movie the mentioned fight tournament takes centre stage for quite a while and one part of me did feel like its length was padding due to lack of other ways of transforming a plot like this into a full length movie. Jimmy does makes up for that criticism by providing us with plenty of fights involving a diverse cast of characters and fighting styles. This makes the event more entertaining and easier to enjoy than I first thought. Many viewer's favourite, The Yoga Master makes his first fighting appearance here and with him comes some of the more supernatural themes present in the movie. This man can extend his arms at will and when this happens I was shocked and delighted. Wonderfully insane stuff is something you could say about this also but I'm not sure if Jimmy was trying to play this as a serious moment or not. Regardless, it's very funny, unintentional or not. I don't know if this type of character had appeared in other kung fu movies but I do think that the makers of the Street Fighter II video game must've seen this movie since a similar character turns up in the game. Surprisingly the One Armed Boxer doesn't participate in the tournament, except as a spectator, and this was another thing that was unusual in terms of these kind of movies structure. Jimmy further parts from the formula when he actually leaves to attend to his school of martial arts. It was probably a way for Jimmy to get noticed among all the hundreds and hundreds of martial arts movies produced at the time. After a long row of fighting contestants, Fung makes a surprise appearance with his weapon of choice and this moment I'll bet the crowd went nuts over. The almost airplane like sound effect used when the flying guillotine goes through the air is so wonderful and it makes the entertainment value grow so much more. While the special effects then, and many years after, weren't that convincing, the Hong Kong filmmakers have always dealt with the limited resources in so many charming ways and it makes one miss that it's not done like that anymore now that computer generated special effects seem to be the in thing. Now that the tournament ends abruptly the main plot gets going again and the One Armed Boxer now has to deal with Fung and a host of other fighters looking for their chance to eliminate the legendary fighter and all this will lead into the movies most memorable fight scenes. Jimmy Wang Yu was never a classically trained martial artist as such (he was a swimmer) but he compensates his lack of ability by having the character use his wits rather than his martial arts. We see him set various traps for his opponents that gives him quite an advantage in two of the three fights during the latter part of the movie. The scene that stands out the most is the fight with the barefooted Thai Boxer and it takes place inside a small house with metal plates as a floor with fire going on around them. This creates quite a fun and original fight but boy is it ever sadistic! In the end the Thai Boxer can't even stand on the plates and eventually expires, kind of a cowardly way to win a fight but we like it. Interestingly the One Armed Boxer is never really seen as a heroic figure but he's of course the closest thing to it amongst all the other people in the movie. What makes this movie a classic to me is the final fight between Fung and The One Armed Boxer. It starts outdoors and after disabling the inner knives of the guillotine, the fight moves to the village and into a coffin shop where again The One Armed Boxer has set out some fairly elaborate traps. I will not spoil the fun of this scene but here it feels like Jimmy's directing and the Lau Brother's choreography really came together. We don't get to see too much hand to hand combat but with well chosen ways of damaging his opponent and good camerawork, this scene clearly stands out and is to this day probably vividly remembered by people who has seen the movie. Even if the rest of the movie had been thrash, this scene would've at least made it worthwhile. Acting wise there's not much too say about Master Of The Flying Guillotine. Jimmy Wang Yu and Kam Kong both put in solid performances. None of the characters gets a detailed background but they are what they are and more is not needed. Jimmy conveys a decent sense of honour and dignity to his role, even if he cheats his way into winning some fights. Kam Kang is also good under that very familiar make up consisting of the long white hair (at least in the beginning) and freaky eyebrows. The supporting players I'm sure consist of many now known faces but I only recognized one and that is Lau Kar-Wing who turns up as one of the tournament fighters. Of course the movie is a little rough around the edges story wise but it's something you do accept even if some plot devices are never fully paid off. The pace is pretty good so you don't have to worry about the little details, it's about the big picture (Ed Wood reference for those attentive ones out there). Then again I'm sure many classic kung fu pictures has elements about them that are not perfect. So we have to come to the end and boy did I ever have fun watching this movie! Would I have enjoyed it as much in English and pan & scan? 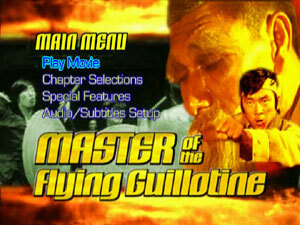 Probably not, this is THE way Master Of The Flying Guillotine should be seen. Hopefully more old school releases will be given the same treatment outside of Celestial's planned Shaw Brother's dvd's. As mentioned earlier in the review, Pathfinder discovered the original negative and also scraped together the footage needed to bring us this fully uncut version of Master Of The Flying Guillotine. The 2.35:1 aspect ratio is preserved and for the most part this restored, remastered and non anamorphic print looks good but not great. When it looks the best the colours are fairly vibrant and detail acceptable for an old movie. However at times the source material was probably too beat up to do anything about. This results in some scenes being quite heavy on print damage and some really nasty light flickering are also present in a few scenes. What I guess is some of the reinstated footage also looks grainy and colour timing seems off compared to other scenes. Overall you have to take into consideration that it probably looked a hell of a lot worse and given that Pathfinder probably are a small company, their work is pretty damn good. Very watchable and fans who've only seen the video versions will get a kick out of seeing the movie in widescreen for the first time. We get two sound options and one is the Mandarin dub for the movie and the other the English one. 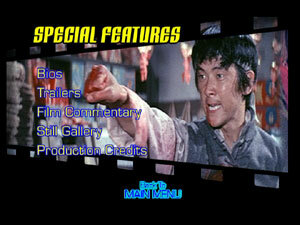 Mandarin was the language of cinema at the time so that's why no Cantonese track is present on the disc. The 2.0 track is, as expected, very centered and sounds quite harsh but it's not going to sound any better and having it on the disc makes for a great experience. I haven't listened to the English track but apparently there was no full English dub for this longer version of the film so the reinstated footage is presented in Mandarin with English subtitles. I will screen the English dub in the future to get a better sense of what footage is new to this release. The English subtitles are in yellow and very easy to read. I dipped into the English track and noticed that they're almost word for word of the English dub. This doesn't however result in stupidly worded subtitles. For this movie they worked quite well so I'll forgive Pathfinder for this. The subs also placed partly on the widecreen border but I could still zoom in as much as needed without cutting off the subs. Spanish subtitles are also included. For what they call the 'Ultimate Edition' of the film, Pathfinder has included a nice selection of special features also. First is the feature length audio commentary by film critics Wade Major (Box Office Magazine) and Andy Klein (The New Times). They do quite a nice job covering the movie's production, the career of Jimmy Wang Yu and the era which Master Of The Flying Guillotine was made. Wade seems more comfortable with speaking while Andy has some trouble getting his facts spoken out at times. They're not extremely knowledgeable about Hong Kong cinema but in the end I'd gotten some good insights into various aspects of this movie and the Hong Kong movie industry. Next up is the trailer gallery which consists of three trailers for this movie. The Chinese export trailer is actually in English but the content of it is probably the same as the Chinese trailer. 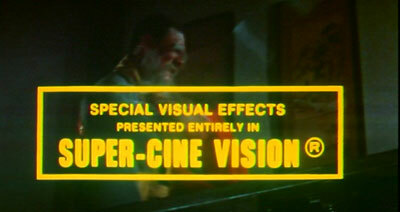 The US Theatrical release trailer is pretty funny and claims such things as 'Special Visual Effects Presented Entirely in Super-Cine Vision'. The final trailer is for this 2002 restored version and is nothing special to be honest. Maybe just because it wasn't as funny as the other trailers. The stills gallery has a few images from the film but also some of the different artwork for the movie in different countries. Shame they weren't bigger as I would've liked to examine them a bit more. Good but not very lengthy biographies of Jimmy Wang Yu and Lau Kar-Leung and dvd production credits rounds up this Ultimate Edition.